Jose Fragozo at Vista Superior Court. Nobody knows how Superior Court judge Richard Whitney will rule on a permanent workplace violence restraining order filed against Escondido Union School District (EUSD) Trustee Jose Fragozo. However, a final decision on the order was expected to come sometime after 1 p.m. Friday, March 25. Meanwhile, Fragozo’s supporters plan to have a rally outside the Vista Courthouse, 325 South Melrose Dr., at 1 p.m. Friday along with a news conference following Whitney’s decision. The activist group National Action Network led by Rev. Shane Harris was sponsoring the rally. The group and Fragozo supporters say the law firm representing EUSD administrators who filed the proposed restraining order are milking the system to make money that should go to local schools. “We are calling attention to the misuse of restraining orders and the exceptional greed in regards to public school funds by the infamous Dan Shinoff,” school activist Kim Garnier said, referring to the attorney who represents the Econdido Union School District (EUSD) and his firm that has been involved in several high-profile school district cases.. The group issued a statement saying, “Mr. 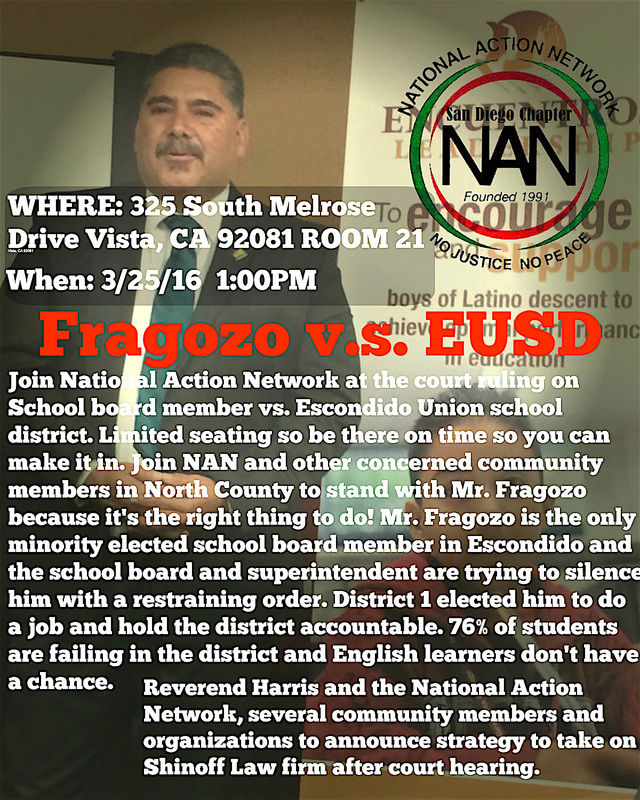 Fragozo is the only minority elected school board member in Escondido. The school board and superintendent are trying to silence him with a restraining order. District 1 elected him to do a job and hold the district accountable. Seventy-six percent of students are failing in the district and english learners don’t have a chance. “Rev. Shane Harris and the National Action Network, San Diego; several community members and North County organizations will announce an aggressive plan to deal with the Shinoff Law Firm that is getting paid by mostly North County school districts for these unnecessary restraining orders on people who are fighting for the minorities within the districts to have a voice,” the group said. Shinoff and representatives of Stutz Artiano Shinoff and Holtz APC could not be reached for comment. The situation began Dec. 2, 2015 with superintendent Luis Rankins-Ibarra and four colleagues filing a temporary restraining order to keep Fragozo 300 yards from school property and meetings. Ibarra et. al. contended Fragozo behaved in a threatening manner while discuss various school issues, including not receiving board agenda packets and the direction of English as a Second Language efforts and declining school enrollment. Fragozo flatly denied those charges, saying he merely disagreed with Ibarra and company and they were blowing up the situation to silence him. Fragozo also has been charged by the San Diego District Attorney with alleged election fraud. The complaint revolves around Fragozo’s residence. The complaint came following the district’s changing of board elections from district-wide to specific district. Investigators also said Joan Gardner, recently named EUSD board president, wrote a letter in July 2012 to the Secretary of State’s Office about Fragozo’s alleged lack of proper residency. Fragozo is fighting the charges. He is free without bail. Should he be found guilty, he could face up to nine years, four months in prison. Be the first to comment on "Law firm representing EUSD under fire as judge expected to rule on trustee order"